There are various luxury car brands available in the market that appeals people to give them a second look at these cars have an excellent design along and an amazing style with sleek lines and smooth curves. The vehicles of luxury brands are always equipped with the powerful engines that not only enhanced the performance of these vehicles, but also give them a strong grip on roads. It is always considered that the luxury car brands always make the luxurious vehicles with a high price and a common man cannot afford these vehicles. There are various vehicles available that are affordable and are available under $35,000. Here is the review of affordable cars that include 2017 BMW 2 series, 2017 Audi Q3 and Lexus NX. These vehicles have a marvelous design with style and curves, it has an aerodynamic design that appeals people to turn their heads and these luxurious vehicles are also fitted with advanced safety and technological features. BMW is considered to be one of the best luxury car brands as they always make amazing vehicles that appeal people. On their best vehicle is 2017 BMW 2 series that is available in the market in $33,150. The design of this vehicle is fabulous as it has an amazing line with smooth lines and sleek curves that make this vehicle stands out among all other vehicles. The structure of this luxurious vehicle is body-colored along with metal-look rub strips and fascia accent, the side mirrors of this vehicle are also body-colored and are powered with power folding and turn signal indicators. Speed sensitive rain detecting variable intermittent wiper with heated jets and nice lights are also the part of this vehicle. The interior of this vehicle is impressive as BMW fitted this vehicle with the finest material that helps the riders to get relaxed and have a comfortable journey. The seats of this vehicle are nicely wrapped with leather and the seats are 2-way power with manual recline, height adjustment, power seatback side bolster support and cushion tilt and extension. The whole interior of the nicely compliments each and every part of the vehicle as BMW worked deeply on each every nook of the vehicle. The prominent interior features include dual zone front automatic air conditioning, remote keyless entry and proximity key start. Ambient lighting is also superbly fitted in the vehicle to enhance its beauty. BMW fitted this vehicle with a powerful engine that boost its performance, it is equipped with 2.0-Litre Turbocharged 4 Cylinder Engine that is able to produce 240hp and 258Nm of torque. It accelerates 0-100 Km/h in 7.0 seconds and the top speed of this vehicle is 230 Km/h. The estimated fuel efficiency of this vehicle is 24mpg in the city and 35mpg on the highway. Its combined estimated fuel efficiency is 28mpg. It has 8 Speed automatic transmission and the fuel tank capacity of this vehicle is approximately 13.7 gallon. Audi is one of the luxury brand cars and they make simply fabulous vehicles that appeals people to turn their heads to give them a second look. One of the best vehicles of 2017 Audi is Q3 and it is available in the market in $30,994. The design of this vehicle is marvelous as it has smooth lines with sleek curves that makes this vehicle stands out among all other vehicles. The structure of this vehicle is body colored with gray rub strip and fascia accent and on the other hand, the side mirrors of this vehicle are body colored with turn signal indicators. The windshield of this vehicle is fitted with rain detecting variable intermittent wipers with heated jets and these wipers automatically detect the rain and start functioning. Audi also fitted this vehicle with amazing lights that help the driver a lot to see clearly at night. If we talk about the interior of this vehicle, then the interior of this vehicle is catchy as Audi worked deeply on every nook of the vehicle to make luxurious, catchy and comfortable. The seats of this vehicle are smartly wrapped with the finest leather that helps the riders to get relaxed and have a comfortable journey. The key features of this luxurious SUV include leather steering wheel, remote keyless entry, dual zone front automatic air conditioning, and ambient lighting. This luxurious SUV is also fitted with advanced safety and technological features that give the riders a secure journey with an enjoyable trip. 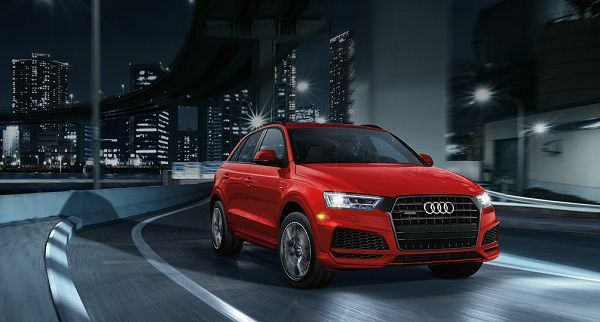 Audi Q3 is fitted with a powerful engine that gives a boost to the performance of the vehicle. It is equipped with 2.0-Litre Turbocharged 4 Cylinder Engine that is able to produce 200hp and 207Nm of torque. The top speed of this vehicle is 230 Km/h and it accelerates 0-100 Km/h in 6.9 seconds. The estimated fuel efficiency of this vehicle is 20mpg in the city and 29mpg on the highway. Its combined estimated fuel efficiency is 23mpg. It has 6 Speed automatic transmission and the fuel tank capacity of this vehicle is approximately 16.9 gallon. Lexus is considered to be one of the luxury car brands as they always make the luxurious and outstanding vehicles with amazing performance. The best luxury car brands Lexus also make an astonishing SUV named as 2017 Lexus NX and the price of this vehicle is $31,751. The design of this vehicle is magnificent as it has sleek lines with smooth curves that appeals people and make them mesmerized. The structure of this vehicle is body colored with black rub strips and fascia accent and on the other hand, the side mirrors of this vehicle are also body colored and are powered with turn signal indicators and Power Folding System. The windows of this luxurious vehicle are covered with deep tinted glass that saves the riders from direct sunlight. The key features of this vehicle are lip spoiler, roof racks rail only and amazing lights that include approach lights, LED brake lights and front fog lights. Lexus also fitted this vehicle with bug tyres that give the vehicle a strong grip on the road. The size of the tyres is 17 inches x 7.0 J 10 Spoke alloy wheels. The interior of this luxurious SUV 2017 Lexus NX is fabulous as the Lexus worked deeply on each and every nook of the vehicle to make it luxurious, catchy and comfortable. All the finest and luxurious material is used on the interior that helps the riders to have a comfortable and relaxing journey. It also includes dual zone front automatic air conditioning, proximity key for doors and pushes start button and ambient lighting. 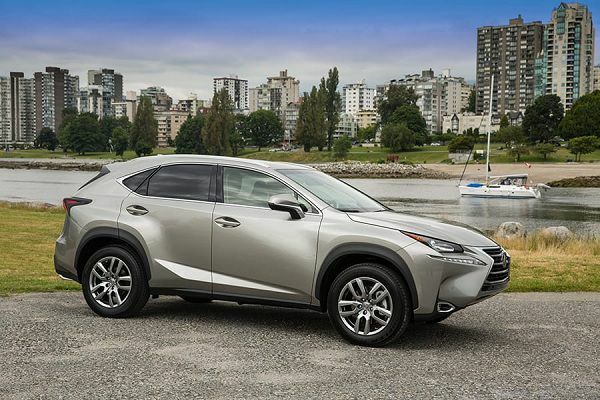 2017 Lexus NX is equipped with a powerful engine that enhances its performance, it is fitted with 2.0-Litre Turbocharged 4 Cylinder Engine that is able to produce 235hp and 258Nm of torque. The top speed of this vehicle is 198 Km/h and it accelerates 0-100 Km/h in 7.2 seconds. The estimated fuel efficiency of this vehicle is 22mpg in the city and 28mpg on the highway. Its combined estimated fuel efficiency is 24mpg. It has 6 Speed automatic transmission and the fuel tank capacity of this vehicle is approximately 15.9 gallon. 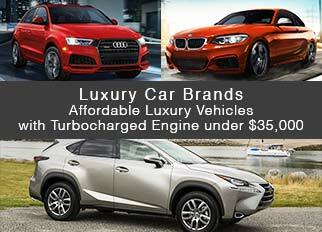 These luxury car brands are available in the market at an affordable price, all these vehicles are available under $35,000. These luxurious vehicles have an amazing design with smooth lines and sleek curves, the shine and glow in these vehicles makes these vehicles stand out among all other vehicles. These vehicles are also equipped with advanced safety and technological features that give the riders a secure and an enjoyable journey.